Climatesense-norpag: Skillful ( so far ) Thirty year Climate Forecast - 3 year Update and Latest Cooling Estimate. Skillful ( so far ) Thirty year Climate Forecast - 3 year Update and Latest Cooling Estimate. 1. Original Forecast v Reality. In the last few months there have been numerous discussions on the WUWT site and amongst establishment scientists questioning the validity of climate models as a source of useful predictions about future temperature trends.Notably, the UK Met Office has reported on "The Recent Pause in Global Warming" for which they have no good explanation.The fact is that,as will be discussed later, their models are incorrectly structured and the modelling approach is inherently useless for making predictions.A much better approach is to recognise and project forward quasi-cyclic quasi-repetitive patterns in the temperature, oceanic systems and solar driver data as was done in the 30 year forecast reviewed here. Here are extracts from the original (6/18/10) 30 Year Forecast and the 2012 update which readers can check against the last 3 years of data and their own experience. "The geologic record shows clearly that the sun is the main climate driver. The Milankovitch multi-millennial orbital cycles in NH insolation are firmly established in the record as are the Schwab and deVries cycles. Other millennial and decadal variations in solar activity are present in the record. TSI is not the only or even the best indicator of solar activity – variations in EUV radiation and the GCR flux (via cloud formation and earth’s albedo) seem to be more important on decadal and centennial scales . Earth’s climate is the result of complex resonances between all these solar cycles with the lunar declination cycles and endogenous earth processes. "There will be a steeper temperature gradient from the tropics to the poles so that violent thunderstorms with associated flooding and tornadoes will be more frequent in the USA, At the same time the jet stream will swing more sharply North – South thus local weather in the Northern hemisphere in particular will be generally more variable with occasional more northerly heat waves and more southerly unusually cold snaps. In the USA hurricanes may strike the east coast with greater frequency in summer and storm related blizzards more common in winter. Arctic and Antarctic sea ice may react differentially to an average global cooling. We might expect sea ice to increase in the Antarctic but in the NH the Arctic Oscillation while bringing cooler temperatures further south may also occasionaly bring warmer air into the Arctic with possible relative loss of sea ice in that area during those years"
In brief - NOAA - HCN - SSTs show that warming peaked in 2003 and there has now been no net warming since 1997 - 15 years with no net warming and CO2 up 8.2%. 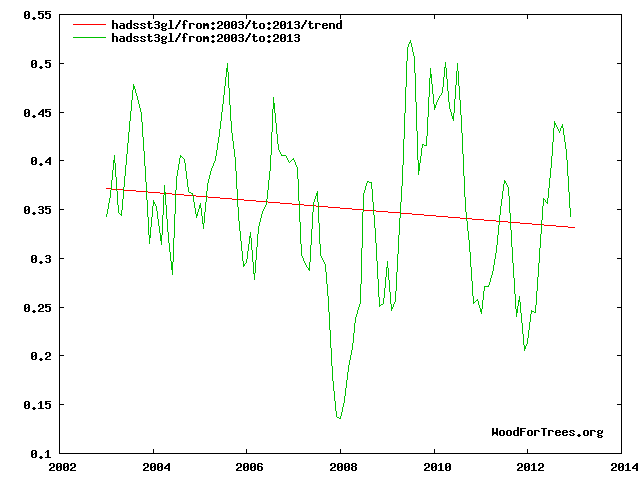 Since 2003 the global temperature trend is slightly negative. The PDO remains in its negative phase while the solar magnetic field strength continues an inexorable decline ,which is looking more and more likely to be a precursor of a Maunder type minimum. Sunspot data and the relatively high GCR count for this stage in solar cycle 24 confirm the secular change in solar activity relative to the previous century. All the recent empirical data - especially the negative phase of the PDO and the continued decline in the Solar magnetic field strength now ( July 2012) suggest that once solar cycle 24 starts its decline in 2014-15 we will see an acceleration of the current slight cooling trend and that this trend might well last for 25 -30 years. Beyond then we do not know enough at this time to make useful predictions"
Readers might note that I think of the thirty year forecast as starting from the warming peak in 2003. For reasons discussed in several earlier posts I use the SST data as the best metric for climate change and the Oulu neutron count as the most useful proxy measure of solar activity. 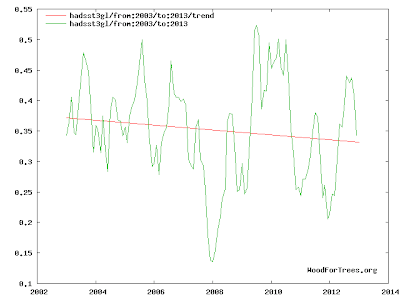 We have now had an eleven year cooling trend during which CO2 has continued to rise steadily - about 19 ppm in total. 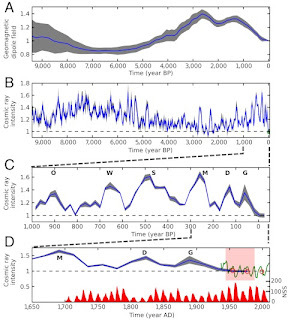 The unprecedentedly high neutron count (GCR and solar activity proxy) as the Solar Cycle 24 maximum is approached compared with earlier cycles and the unprecedented count peak durimg the 23/24 minimum in late 2009 are the main indicators suggesting the continuation and possible deepening of the cooling trend in the coming decades.In addition the Livingston and Penn solar data point in the direction of the possible approach of a Maunder Minimum. 2.How Not to Do and How to Do Climate Science. During the last twelve months I have laid out ,in a series of posts on this site, a review of the basic climate data and of methods used in climate prediction and from these have developed a simple transparent forecast of future cooling. For details see the pertinent posts listed below. 4/2/13 Global Cooling Methods and Testable Decadal Predictions. 5/14/13 Climate Forecasting for Britains Seven Alarmist Scientists and for UK Politicians. The most important points are summarised below. 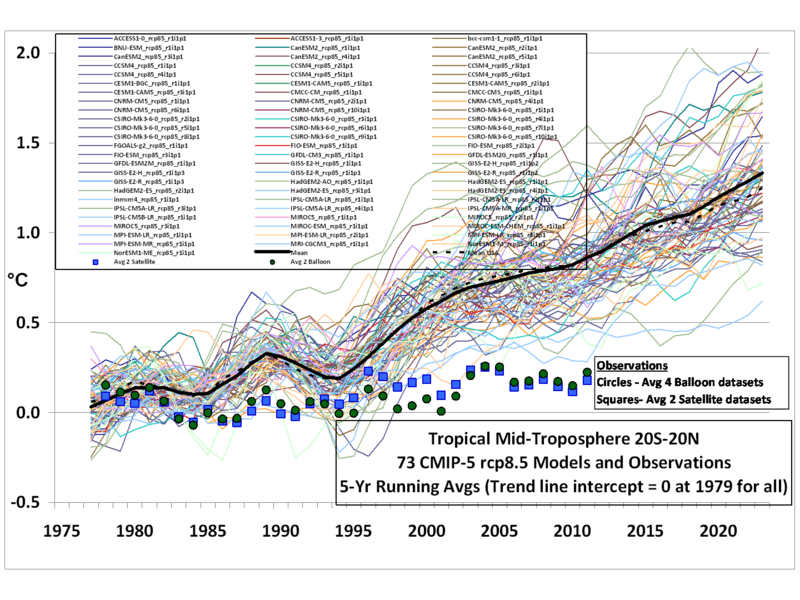 a) Total Collapse of the IPCC - Met Office Modelling Approach - How Not To Do Climate Science. 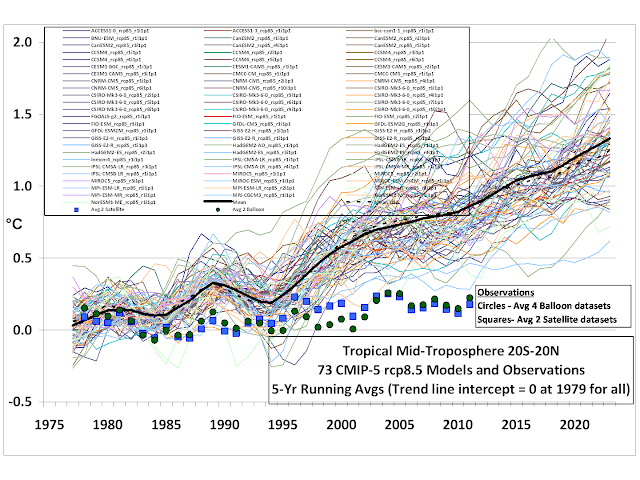 The inadequacy, not to say inanity, of the climate models can be seen by simple inspection of the following Figure 2-20 from the AR4 WG1 report. The only natural forcing is TSI and everything else is classed as anthropogenic. The glaring deficiency of this model structure is immediately obvious. Under natural should come such things as eg Milankovitch Orbital Cycles,Lunar related tidal effects on ocean currents,Earths geomagnetic field strength and all the Solar Activity data time series - eg Solar Magnetic Sield strength, TSI ,SSNs ,GCRs ,( effect on aerosols,clouds and albedo) CHs, MCEs, EUV variations, and associated ozone variations and Forbush events. 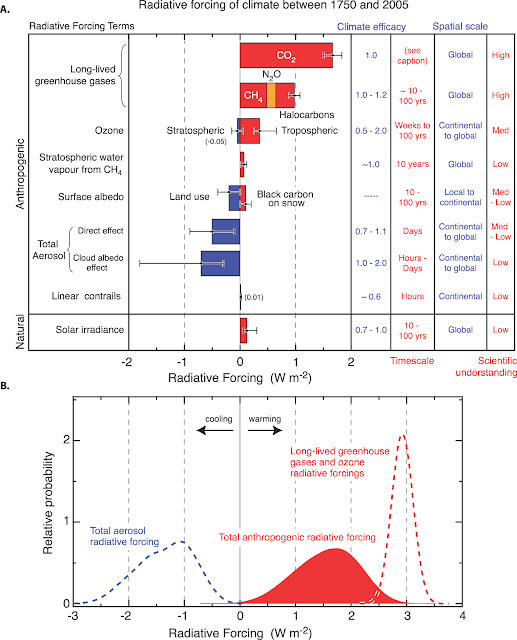 Unless the range and causes of natural variation are known within reasonably narrow limits it is simply not possible to calculate the effect of anthropogenic CO2 on climate. 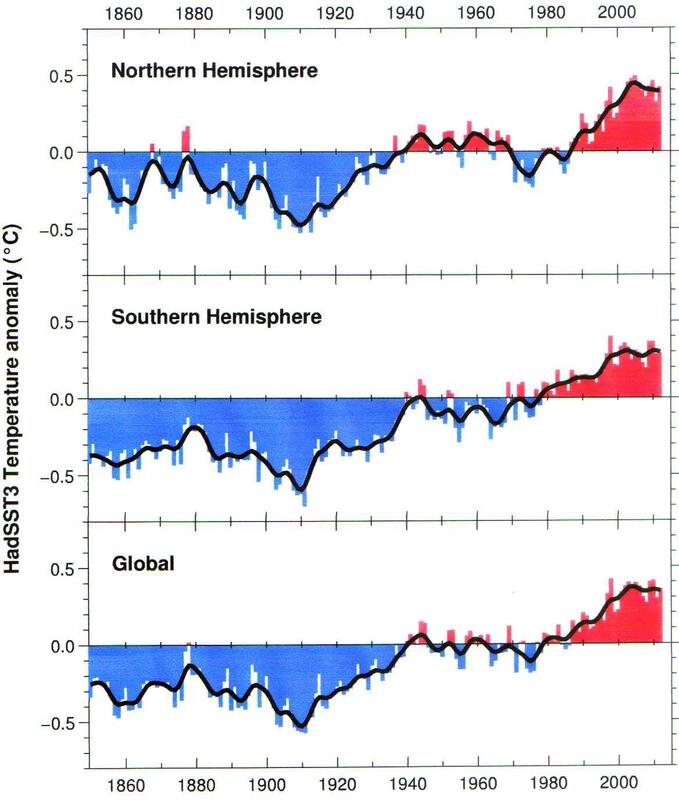 The results of this gross error of scientific judgement ,not to say lack of simple common sense,is seen in the growing discrepancy between global temperature trends and the model projections - see this example from Spencer. This disconnect has been acknowledged by the establishment science community which is now busy suggesting various epicycle like theories as to where the "missing" heat went.Some say its in the oceans (Trenberth) some say its due to Chinese aerosols (Hansen) but the all main actors still persist in the view that it will appear Lazarus like at some unspecified future time.This is like the Jehovah's witnesses recalculating the end of the world each time a specified doomsday passes. In Britain , the gulf between the Met Office expectations for the last several years and the actual string of cold and snowy winters and wet summers which has occurred has made the Met Office a laughing stock-to the point of recently holding a meeting of 25 "experts" to try to figure out where they went wrong.The answer is simple.Their climate models are incorrectly structured because they are based on three irrational and false assumptions. First that CO2 is the main climate driver ,second that in calculating climate sensitivity the GHE due to water vapour should be added to that of CO2 as a feed back effect and third that the GHE of water vapour is always positive.As to the last point the feedbacks cannot be positive otherwise we wouldn't be here to talk about it . Temperature drives both CO2 and water vapour independently,. The whole CAGW - GHG scare is based on the obvious fallacy of putting the effect before the cause.As a simple (not exact) analogy controlling CO2 levels to control temperature is like trying to lower the temperature of an electric hot plate under a boiling pan of water by capturing and sequestering the steam coming off the top.A corollory to this idea is that the whole idea of a simple climate sensitivity to CO2 is nonsense and the sensitivity equation has no physical meaning unless you already know what the natural controls on energy inputs are already ie the extent of the natural variability. "Moreover it is not yet clear which tests are critical for constraining the future projections,consequently a set of model metrics that might be used to narrow the range of plausible climate change feedbacks and climate sensitivity has yet to be developed"
What could be clearer. The IPCC in 2007 said itself that we don't even know what metrics to put into the models to test their reliability.- ie we don't know what future temperatures will be and we can't calculate the climate sensitivity to CO2.This also begs a further question of what mere assumptions went into the "plausible" models to be tested anyway. In summary the projections of the IPCC - Met office models and all the impact studies which derive from them are based on specifically structurally flawed and inherently useless models.They deserve no place in any serious discussion of future climate trends and represent an enormous waste of time and money.As a basis for public policy their forecasts are grossly in error and therefore worse than useless. b) A Simple Rational Approach to Climate Forecasting based on Common Sense and Quasi Repetitive- Quasi Cyclic Patterns. How then can we predict the future of a constantly changing climate? a) Night is colder than day. b) Winter is colder than summer. d) Temperatures vary more widely in deserts and hot humid days are more uncomfortable than dry hot days - humidity (enthalpy) might be an important factor. We use Sun Screen against UV rays - can this be a clue? 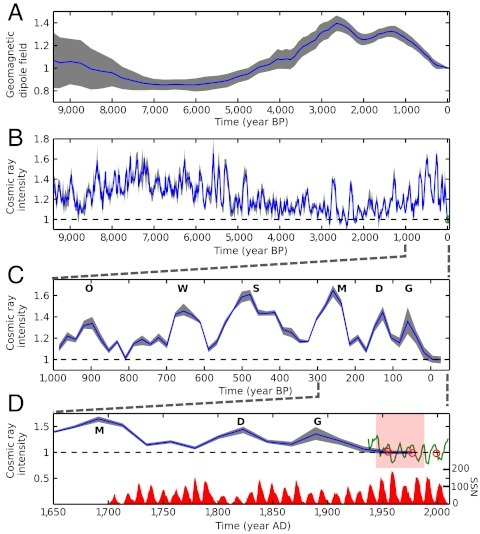 e) Being a Geologist I knew that the various Milankovitch cycles were seen repeatedly in the Geologic record and were the main climate drivers controlling the Quaternary Ice Ages. f) I also considered whether the current climate was unusually hot or cold. Some modest knowledge of history brought to mind frost fairs on the Thames and the Little Ice Age and the Maunder Minimum without sunspots during the 17th century . The 300 years of Viking settlements in Greenland during the Medieval Warm Period and viniculture in Britain suggested a warmer world in earlier times than at present while the colder Dark Ages separate the MWP from the Roman Climate optimum. g) I noted that CO2 was about 0.0375% of the Atmosphere and thought ,correctly as it turns out, that it was highly unlikely that such a little tail should wag such a big dog. I concluded ,as might any person of reasonable common sense and average intelligence given these simple observations that solar activity and our orbital relations to the sun were the main climate drivers. More specific temperature drivers were the number of hours of sunshine,the amount of cloud cover,the humidity and the height of the sun in the sky at midday and at Midsummer . It seemed that the present day was likely not much or very little outside the range of climate variability for the last 2000 years and that no government action or policy was required or would be useful with regard to postulated anthropogenic CO2 driven climate change. These conclusions based on about 15 minutes of anyone's considered thought are,at once , much nearer the truth and certainly would be much more useful as a Guide to Policymakers than the output of the millions of man hours of time and effort that have been spent on IPCC - Met Office models and the Global Warming impact studies and the emission control policies based on them. One method of investigationg climate change is to perfom spectral and wavelet analysis on the temperature and any possibly useful driver associated time series to find any quasi-cyclic quasi-repetitive patterns which can be projected forwards - but it is not even that difficult. It turns out, on reflection perhaps not surprisingly, that simple inspection of the temperature and ocean system data is sufficient to detect useful quasi-periodicities which probably embrace the greater part of the changing climate signal.Furthermore,although it is obviously ultimately highly scientifically desirable, it is not necessary to understand exactly how the system works to be able to make useful forecasts. For decadal scale variations an approximate 60 year cycle which seems to correlate temperatures and the PDO is well established in the temperature data and in the record of the PDO. PDO indices, 1900-2008 with predictions to 2040. "The recent shift from PDO warm mode to cool mode is similar to the shift that occurred in the mid-1940′s and resulted in 30 years of global cooling (Fig. 4). 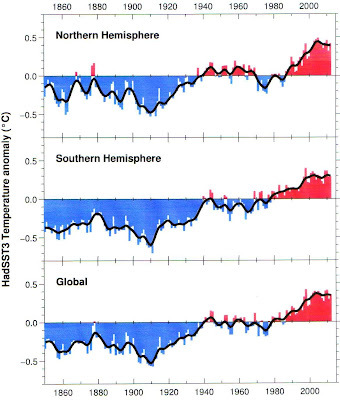 The global warming from ~1915 to ~1945 was also brought on by a mode shift in the PDO (Fig. 4). Every indication points to continuation of the PDO patterns of the past century and global cooling for the next 30 years (Fig. 4). Thus, the global warming the Earth has experienced since 1977 appears to be over." For multidecadal and centennial predictions we need to know where we are relative to the appriximately millenial cycle seen in the ice core and proxy temperature reconstructions. Fig 6 . Gisp2 Temps and Epica CO2. The millenial spacing of the temperature peaks over the last 2000 years is clearly seen in the Gisp2 ice core data Fig 6. 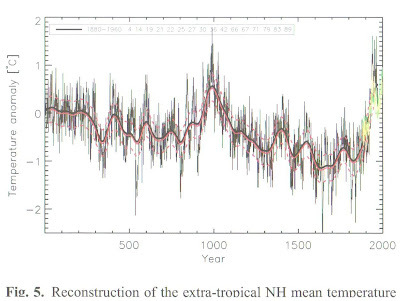 Incidentally, the CAGW fraternity might note that this Figure also indicates the total disconnect between the general trends of CO2 and Temperature over the last 8000 years. For forecasting purposes it is perfectly reasonable to assume from Figures 5,6 and 7 as a conservative working hypothesis that the temperature peak at about 2003 was a peak in both the 60 year and the Millennial cycles and estimate the future cooling trend on that basis . The shape of the curve of Fig 7(Fig 5) from 1000 - the present should replace the Mann-IPCC hockey stick in the public conciousness as the icon for climate change and a guide to the future. The simplest assumption for temperature trends to be expected following the current peak is that the downslope to about 2650 AD may well look like the general downslope from 1000 to1650.Naturally, predictions beyond the 30 years which coincides with a PDO declining temperature trend would be increasingly more speculative. Using the HADSST 3 Global data as a more detaled mirror image template for the coming centuury (Fig 8) produces the following estimates . which may well represent an open phase of the iris effect. The relatively higher counts at the cycle 23 and especially the cycle 24 neutron minima troughs (solar cycle SSN peaks) suggest a continuing downtrend in temperatures to at least 2024. There was a secular change in the related Ap index in 2004-5 which could presage a sharp temperature drop in about 2016-17 . The Oulu data show an increase in the neutron count also in 2004- 5 which might indicate the same thing and which is already built in to the system. 8 The effect of increasing CO2 emissions will be minor but beneficial - they may slightly ameliorate the forecast cooling and more CO2 would help maintain crop yields . The Solar Cycles 2,3,4 correlation with cycles 21,22,23 would suggest that a Dalton minimum could be imminent. 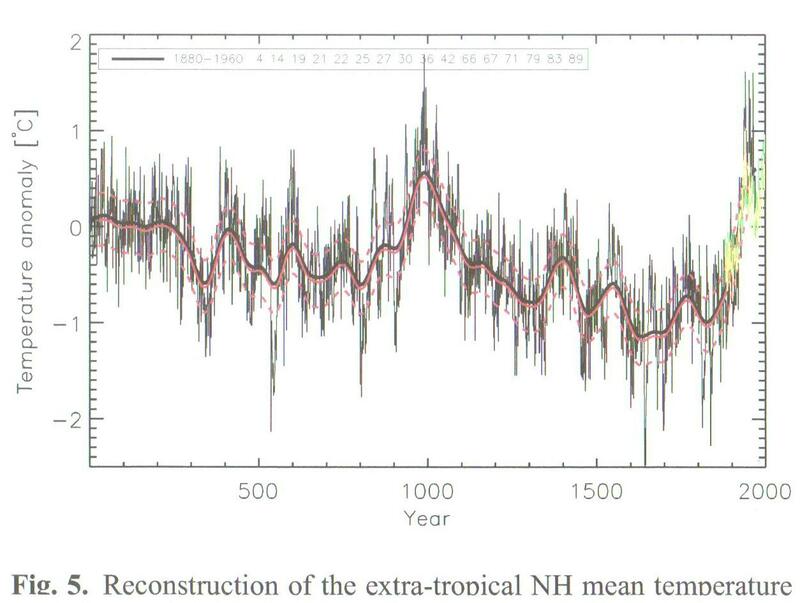 The Livingston and Penn Solar data indicate that a faster drop to the Maunder Minimum Little Ice Age temperatures might even be on the horizon. If either of these actually occur there would be a much more rapid and economically disruptive cooling than that forecast above which may turn out to be a best case scenario. How confident should one be in these above predictions? The pattern method doesn't lend itself easily to statistical measures. However statistical calculations only provide an apparent rigor for the uninitiated and in relation to the IPCC climate models are entirely misleading because they make no allowance for the structural uncertainties in the model set up.This is where scientific judgment comes in - some people are better at pattern recognition and meaningful correlation than others.A past record of successful forecasting such as indicated above is a useful but not infallible measure. In this case I am reasonably sure - say 65/35 for about 20 years ahead. Beyond that certainty drops rapidly.I am sure,however, that it will prove closer to reality than anything put out by the IPCC, Met Office or the NASA group. In any case this is a Bayesian type forecast- in that it can easily be amended on an ongoing basis as the Temperature and Solar data accumulate. Just one quibble but an important one. It appears that when the sun is less active the gradient of tropopause height from equator to poles is less not more. A steeper gradient tends to push the entire circulation poleward for a zonal flow rather than the meridional flow as observed. It is necessary to propose that low solar activity actually warms the stratosphere preferentially towards the poles so as to push the jets equatorward in a meridional flow. If this solar cycle continues to not just match, but to exceed (in sunspot inactivity) sc5 as it has so far http://www.landscheidt.info/?q=node/50 it demonstrates that your theory is not just valid, but even possibly slightly cautious in its prediction of culture cooling! The http://www.landscheidt.info/ site blew my mind and completely destroyed any lingering credibility that the IPCC climate models had, and your theory is representative of a credible, logical, and scientific approach to climate research. Fascinating; I think I believe you. But your text is irksome to read. Please fix the punctuation. This is not Arabic; commas are not preceded by a space, and periods are always followed by one in English. You could fix this with a couple of passes of your Find/Replace function. Please do so. I have been reading articles linked on the realclearpolitics.com site (many articles in their science section, and elsewhere). I have realized (as appears about half the world, as well) that the global warming crowd is all wet, their projections of global warming are ludicrous. But, the key realization for me has been that the global warming crowd is connected like a Siamese twin to the leftist democrat party and other leftist groups and parties worldwide, in order to use the global warming theme to hoodwink their country's into socialist control of the energy industry and extra taxation schemes, to give to the left even greater, gigantic power over society. The plans they have, their vision, would likely involve trillions of dollars of spending, and would accomplish nothing in terms of "solving" non-existant global warming, but would have MASSIVE detrimental effects on western democracies, the ones most likely to be swayed by the global warming political correctness (say what you want about dictatorships such as Russia and China, but they pay zero homage to the hugely destructive forces of political correctness). The traditional strength of America, almost 400 years since the Pilgrims, has been it's steady rule of law, combined with personal freedom, free enterprise, and in past decades (up to the Great Depression), quite limited government. If the Global Warming adherents were to have their way, the MOST important industry, all aspects of energy production, the key industry which has born the modern age (oil and gas usage created the modern world) would fall under their destructive control. The USA remains one of the last bastions where private enterprise controls the energy industry. In most other countries, the energy industry has been nationalized, and these national companies are very inefficient compared to the equivalent American industry. Indeed, the most recent revolution in the oil and gas industry has been the hugely successful development of oil and gas shale deposits. These technologies were created in America, and now, the whole world is clamoring in trying to duplicate these successes in their countries if they have shale deposits containing hydrocarbons. However, they will surely be dependent upon partnering with American know how. (Imagine government running our biggest oil companies, with nepotism, union control, political control, injection of political correctness, with oil production being wound down and cash flow siphoned off to unrelated political causes, and to wasteful, unworkable alternative energy projects). If the Global Warming special interest groups and leftist political movements were to implement their desires, as illogical as they are, the main thrust would be the government takeover of the oil and gas industries, as well as massive interference in energy production in electrical utilities and energy usage in manufacturing., and the result would be a MASSIVE misallocation of resources. I would expect that the USA economy would lose many trillions of dollars wasted on curbing non-existent global warming, and thrown after nascent, uneconomic, alternative energy fiascoes. Communism failed world wide, because as a system, it was an entirely inefficient director of economic resources into productive uses to advance the economic well being of the nation. Central planning is clumsy, and it is always beholden to the personal whims and collective ideology of political movements, regardless of how ludicrous their ideology turns out to be. In contrast, free enterprise is completely organic, in that all economic decisions, must, by nature be profitable, or else the individual enterprise becomes defunct. The net effect of the leftist government takeover of the private energy industry, and the imposition of massive, all encompassing controls across the board for industry, in accordance with the dogma of curbing global warming, would be akin to what happened in Eastern Europe when the communists took over. Both Russia, and Eastern Europe became extremely inefficient in producing economic well being, as resources were simply misallocated for decade after decade. Their economies were a cruel joke for their people compared to the galloping advances made by America. Thus, the eventual, government mandated remedies to the created myth of global warming, which is being actively propagandized by the leftists around the world, and in America, by the democrat party, IF implemented, will be a catastrophe of unprecedented proportions, leading to long term destruction of our economy on a massive scale, and long term destruction of the American tradition of the rule of law, small government, free enterprise, and personal freedom. In short, the combination of the global warming adherents and the leftist democrat party is the greatest risk America has faced, likely greater than the enemies we faced down in WWII, and the crisis of the Great Depression. I believe that the scientists standing up to this politically correct, leftist myth of global warming are performing great service to America, and to the Western World, as well the earth in whole. Exposing this massive fraud is crucial. Wasted economic resources are a tragedy. Human well being can be advanced so much better, and economic and political catastrophe avoided (and freedom prevailing inoculates against despotism) if we are able to avoid the attempts of the leftist, would be autocrats, from harnessing our economy to the Sisyphusian task of curtailing non-existent global warming. I whole heartedly advise disseminating this blog in all appropriate forums. The more minds changed, the better chance we have of defeating this incredibly insidious rise of political correctness and all the aspects of totalitarian leftism, in America, and around the world. The propaganda of totalitarian leftism must be thwarted if we are to be able to live in a sane society guided by reason and the rule of law. American traditions need to be saved, upheld, as they are precious. It is our heritage we are preserving. America advanced through freedom, and this was the foundation of our people’s ability to pursue science and harness it to serving mankind. Despotism and propaganda are the kryptonite of truth and science. Maverik Thanks for your accurate comments on the political aspects of the CAGW scare. I certainly endorse your advice "I whole heartedly advise disseminating this blog in all appropriate forums. " and welcome any efforts you may make in this regard. Even the sceptics still frame most of their arguments in the context of the modeling method which should actually be ignored. which shows that are at least two known cycles that influence the weather. The Gleissberg solar/weather cycle (87-88 years) was known for a long time. Peristykh, Alexei N.; Damon, Paul E.
Among other longer-than-22-year periods in Fourier spectra of various solar-terrestrial records, the 88-year cycle is unique, because it can be directly linked to the cyclic activity of sunspot formation. Variations of amplitude as well as of period of the Schwabe 11-year cycle of sunspot activity have actually been known for a long time and a ca. 80-year cycle was detected in those variations. Manifestations of such secular periodic processes were reported in a broad variety of solar, solar-terrestrial, and terrestrial climatic phenomena. Confirmation of the existence of the Gleissberg cycle in long solar-terrestrial records as well as the question of its stability is of great significance for solar dynamo theories. For that perspective, we examined the longest detailed cosmogenic isotope record—INTCAL98 calibration record of atmospheric 14C abundance. The most detailed precisely dated part of the record extends back to ˜11,854 years B.P. During this whole period, the Gleissberg cycle in 14C concentration has a period of 87.8 years and an average amplitude of ˜1‰ (in Δ14C units). Spectral analysis indicates in frequency domain by sidebands of the combination tones at periods of ≈91.5 ± 0.1 and ≈84.6 ± 0.1 years that the amplitude of the Gleissberg cycle appears to be modulated by other long-term quasiperiodic process of timescale ˜2000 years. So that is how I know. We are 7 years away from disaster. Unless we do something now. Brian - Both constructive criticism and supportive comment gratefully received .Thanks..